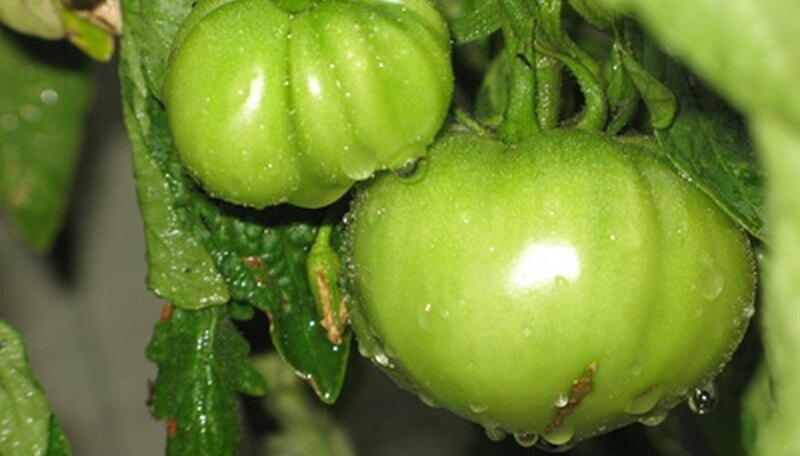 Many gardeners know that cool temperatures can be detrimental to tomato plants. Not many know that excessive heat can damage tomato plants, too. Selecting tomato varieties that are heat-tolerant or finding a way to provide plants some relief can help protect your tomato harvest. Tomato plants prefer a growing environment where the daytime temperature reaches at least 75 degrees F and evening temperatures don't drop below 50 degrees F. However, daytime temperatures consistently above 90 degrees F and evening temperatures that stay above 75 degrees F are considered excessive heat and are detrimental to tomato plants and growing fruit. One of the more obvious effects of excessive heat is that tomato plants will flower, but fruit won't set and mature. You may also notice a condition known as blossom drop, where the flowers fall off the plant. Tomato fruits that develop in excessive heat will have reduced flavor, altered texture and may discolor. The inside of the tomato will develop white tissue and yellow areas on the outside of the fruit. Also, lycopene, the antioxidant that makes tomatoes red, can't develop in temperatures above 85 degrees F, according to the Tomato Gardening Guru website. If you live in an area that routinely experiences hot summer temperatures, consider planting a variety of tomato plant designed to endure these temperatures. Look for these varieties that can stand up to high heat as well as humidity and dry weather: Azoychka, Hot Tom, Arkansas Traveler, Eva Purple Ball, Cherokee Purple, Costoluto Genovese, Costoluto Fiorentiono, Homestead 24 and Ponderosa Pink. If you are unable to find any of these varieties, your county extension office can recommend a suitable variety for your area. An unusually hot summer can take anyone by surprise. If it's warmer than normal and you planted a tomato variety that isn't responding well to the heat, consider giving some sort of shade for the plants. Shade plants with a canopy, leaving enough space over the top of the plants and adequate ventilation so heat isn't trapped. Dark colors absorb and retain heat; it's best to choose a light-colored covering. Remember that tomato plants need eight hours of sunlight daily. Avoid pruning plants, as the leaves naturally offer shade to developing fruit. In the event of excessive heat, heat-resistant tomato varieties are most likely to still produce fruit. When preparing your garden, choose an area that gets enough sunlight and also has some shade. If that isn't available, plan to use a canopy or some other shade source to give tomato plants relief from heat. Your local county extension office has advice specific to your gardening needs.